Today’s research request came from Alison R. of Wellesley, MA. You bet, Alison! Thanks to you and others, I’ve had many requests recently for research in this category. I called my experts and we went to work! Our research uncovered 3 models, by two quality manufacturers, that meet the GreatStuffThatWorks criteria for superior benefits, performance and customer satisfaction. Any of the three choices below have proven themselves to be the stuff people love to live wIth. As always, let me know what you think. We’re all in this together. To help you get a great price with a quality merchant, we also worked to track that down. Click on any of the highlighted product names to see your price today! Beautiful, stainless steel design that integrates exceptional performance with exceptional human engineering. Large, easy to read display, Intuitive design, Crumb tray pulls out from front, Intelligent power management system tailors heat to task, Toast rack pulls forward when door opens, Selectable Convection cooking reduces cook time by 15%-20%, while crisping outside, Defrosts then toasts bagels automatically, High capacity in small space, Interior walls are non-stick, Top designed as food warming area, plus more. Comes with baked enamel broiler tray/pan and non-stick 13” pizza pan. To help you get a great price with a quality merchant, we also wotk to track that down. Click on any of the highlighted product names to see your discounted price today! To help you get a great price with a quality merchant, we also work to track that down. For decades, my trusted companion, an ancient GE Toaster-R-Oven, with its finger worn face plate and unhinged crumb catcher, has stood by my side. But like an aging tribal chief, it’s ready to pass on its wisdom to a new generation. Enter the Counter Top Oven: The new fangled way to toast, bake, broil, warm and in some models, use convection, to cook faster, more efficiently and brown at the same time. Toaster oven, my eye! In fact, now most two to four portion meals can be made without ever powering up our “real” oven at all. When I began the search for a toaster oven that would meet the GreatStuffThatWorks criteria, my first thoughts went back to why I originally bought my current toaster oven. I wanted it to be a small, fast way to warm up food and do toast. But the more I looked at how my wife and I were using it, the more I realized that our little counter companion had become the first place we’d try to cook anything. Chicken breasts, pork, individual portion tenderloins, fish, crescent rolls (one of my favorites), mini muffins, you get the idea. We were willing to accept over cooked food and unevenly toasted bagels because it was fast and easy. Sad, isn’t it? We had never considered using it for any of that when we bought it 15 -20 years ago. And neither had the engineers who designed it. But, human beings life styles have evolved from wanting their “Toast-R-Ovens” to primarily toast and warm, to in many cases, being the better alternative to microwave cooking. Statistically, during the 1950’s only about 10% of American households were single people. By the end of the 1990’s that number had grown to 26%. Nowadays, only about 52% of American households are married couples. That means there are a lot more people out there whippin’ up dinner for one or two. And with the number of empty nesters growing, so is the number of people considering the new age “Toaster Oven” as an everyday cooking appliance. This should be causing a change in what companies are designing to meet that need. Yet, our research found most toaster ovens today let people down. There is a jungle of low end, poor performing, cheaply constructed units out there. Most can’t even toast bread evenly! But we found 2 quality manufactures and 3 GreatStuffThatWorks qualified products, that emerged from the research. These units provide great user benefits, superior performance and have proven themselves to be the ones people love to live with. Remember that since price, although definitely important to each of us, is not a criteria for qualifying as a GreatStuffThatWorks product, you’ll ultimately decide what makes sense for you to spend vs the benefits it provides. But the 3 models we found cover a span of price points that will hopefully fit your budget: $249.00, $179.00 and $139.00 average street price as of this review. Unfortunately, our research showed that low cost in this product category (under $100.00) translated, for a high percentage of people, into both short and long term user dissatisfaction. 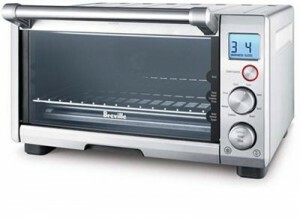 The Breville BOV800XLemerged as the most comprehensively designed toaster oven on the market. It’s really a “Counter oven that automatically bakes, broils, browns, warms, convection cooks and does anything a larger oven will do faster and more efficiently, just with smaller portions” oven. In a word. Brevelle designed both the BOV800XL and the BOV650XL (see below) from the ground up specifically for the American market. They clearly asked the right questions first. The look, fit and finish is superior. There are no perfect products. But, based on our extensive research, there are few products on the market that have as strong a positive customer reaction as the 800XL. It also does an excellent job evenly toasting bagels and bread! (Who’d a thunk it?). It’s so smart, it warms both sides of a bagel, but only toasts it on one side! Using Breville’s Element IQ system, this 5 element design automatically adjusts the number of elements, their power and location, based on what you’re cooking. This not only allows it to evenly toast your bagels on just one side, but for each cooking task it uses energy only where it’s needed, bringing up to 1800 watts to the party only when necessary. For toast, something our research showed most “toaster” ovens do poorly, you simply dial the number of slices, how dark you want them and the 800XL adjusts the heat and number of elements to make it perfect. I tested multiple settings and each accomplished an incremental, even level of darkness. Very cool. (hot actually). Speaking of hot, one of the complaints about toaster ovens is about being burned by the hot metal case and door. Now Breville engineers haven’t solved this issue completely, but they did add design features that help make it safer to use and to take advantage of the heat. 1.) The grab bar door handle is large, easy to grip and sweeps up and away from the door for safer hand clearance. 2.) Control knobs, although silver in color, are not made of metal (one of the few components in this unit not of brushed metal) for good reason: The knobs need to remain cool to touch when the oven is hot. 4.) A custom bamboo cutting board (optional accessory) stores perfectly covering the top of the oven. This keeps the hot top shielded from hands and keeps whatever’s on top of the board cool, even when cooking. And with bamboo being renewable, harder than most hardwoods and naturally antibacterial, it’s a very handy cutting board for quick prep at the counter. The human engineering in its design (vs gadgets) makes control very intuitive. Really. You won’t need a course to use it. My review and its included videos will probably be all you need to know. The rest will be just getting used to how quickly it cooks and the settings you prefer. 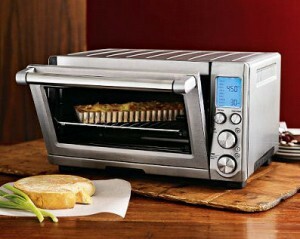 First, unlike the majority of toaster ovens on the market, Breville designed the crumb tray to pull out from the front! No need to spin the unit around or lift it up as you jockey the tray from its guides. To start, you simply turn the smaller top knob to tell it what type of food you want to cook or toast. Another helpful feature is the “pull forward” cooking rack. When the 3 position rack is in the center “Toast, Cookie, Bagel, Pizza” position, (clearly marked on the glass door) the door integrated magnets automatically pull the rack forward as the door opens. This makes removal of toast and other items on the rack much easier and safer. This pull forward rack feature does not work in the other two “Bake/Roast” or “Broil” rack positions. However, items in these categories are usually cooked in Pyrex or metal containers and would likely be too heavy to allow the rack to slide. It’s easy to quickly change the rack height positions, but be aware there are no stops on the back of the rack to keep it from coming out when you reach the end. Convection: One of its benefits is it can reduce cooking time by 15%-20%. Another advantage is it allows food and baked delights to be crisp on the outside and moist on the inside. And its convection fan is quiet. You probably won’t even know it’s running. Compared to a full sized oven, this oven it is often at temp faster, with a lot less heat in the kitchen. Defrost: When engaged, the Brevelle will automatically add time to the clock to defrost your frozen Toast or Bagel as part of the total toasting cycle. FYI-The Frozen setting is only designed to be used in the Toast and Bagel settings, even though it may illuminate on the display in other modes. Temperature Display: Toggles between either Fahrenheit or Celsius scale. When the unit is not in use for several minutes, all display backlighting turns off. Although the LCD display is still barely readable, there are no lights of any kind that remain lit, so the unit can disappear into the kitchen background as much as possible. It would nice if Breville could add an LED light to the interior, but none of the other toaster ovens we found had this feature either. The display also provides visual cues when using the oven. Two colors back light the display, depending upon the function operating at the time. 1.) A soft Blue backlight displays when adjusting the settings. 2.) An Amber backlight indicates the cooking mode is active. When the oven requires pre-heating, the temperature and word “Preheating” will flash while the unit is ramping up to speed. It will signal with a beep when its time to put the food in and then immediately begin to count down from there. It does not preheat and hold the timer. And that pretty much covers it! You now know more about toaster ovens than you probably ever imagined, but you’ll look at any other toaster oven knowing what elements a quality human engineered design can have. If you’re looking for a well designed counter companion that has the most versatile range of cooking options in the smallest space, the Breville BOV800XL makes the cut as a GreatStuffThatWorks qualified product. 1.) Due to the oven’s ability to pull up to 1800 watts when needed, if your kitchen has several appliances on the same circuit, you may trip a 15 amp breaker if the toaster oven runs simultaneously with another high draw appliance. 2.) When cooking with convection, be sure to reduce standard recommended heating times by about 20% or you will over cook your stuff! I do the quick math like this: If it says “10 – 15 minutes,” set the Breville at 10 mins and check it.. If it says 20 minutes, use 20 x .20 = Reduce cooking time setting time by 4 minutes, ie. set at 16 minutes and check it.. 3.) Disposable aluminum trays are not recommended for use in the oven. According to Breville, any standard baking vessels, Pyrex, Baked Enamel, or other oven safe cookware works fine. PS: My sister was one of the people who requested we research toaster ovens. Because both my sister’s family and mine needed a toaster oven rescue, both she and I now have Breville’s. We have the BOV800XL with convection and my sister bought the BOV650XL, the smaller unit without convection and a few other feature differences (See below). We purchased both units at the prices listed with the units. Both units have the benefits, performance and human engineering you’d expect from a GreatStuffThatWorks qualified product. When I did my company Customer Service Check, I called shortly after Breville opened on the west coast (11: 05 EST). In December my wait time was 25 mins, but when they answered they apologized for the delay and were helpful, knowledgable and friendly. Customer Service Contact Information: Breville USA. Consumer Services Dept. Tip: If you know you need to speak to a customer service agent, wait until the first message completes and asks you to select 1 for product questions. Select 1, then hit * to immediately enter the cue for an agent and skip listening to other options. Alternate contact: askus@brevilleusa.com They say email response is 24 hrs. 1.) A two part enamel coated broiler pan, with a slotted top pan and a bottom catch pan that can also be used by itself for other cooking. 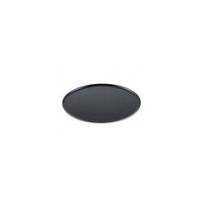 The pizza stone distributes heat evenly across the pizza base to maintain constant baking temperature. The pizza stone’s porous surface absorbs moisture from the pizza dough, resulting in a crisp brown pizza crust. Pre-heat the pizza stone in the Smart Oven™ for 15 minutes at 450°F (230°C). It may also be used with traditional household ovens. 13″ non-stick pizza crisper pan with 1/3 inch crisper holes for supreme golden-brown results. Designed for use with the Breville Smart Oven™, the crisper may also be used with traditional household ovens. The Breville BOV650 is the little brother (or sister) to the Breville BOV800XL. As the name “Compact” indicates, it’s smaller in footprint with a frameless glass door, no convection option, with a smaller display. It has the same great looking, stainless steel brushed finish. Due to the frameless door design, the one feature I miss is that the door does not pull the center positioned toast rack forward when you open the door. It still has space for up to a 12” (vs 13”) pizza capacity and up to 4 (vs 6) slices of toast. The core cooking functions that make the Breville BOV800XL exceptional are also still in the Breville BOV650XL. It uses the same 5 Element IQ system with up to 1800 watts. It defrosts, has front crumb tray access, selection of 8 different types of cooking / toasting settings using two large, straight forward knob controls. The missing 9th selection, present on the 800XL is Warming, but you can create the same effect by putting the Bake function on low. Although the easy to read display is smaller in area, it retains the same large number format, for quick glance viewing across the kitchen. A custom Bamboo cutting board is also available, downsized for its smaller top. If you have the convection feature in another appliance or just need a smaller unit to fit your space, the Breville BOV650XL will give you the design and performance elegance of its big sister, but in a smaller space. 12¨non-stick pizza pan that doubles as a baking sheet. Designed for use with the Breville Compact Smart Oven, the pizza pan may also be used with traditional household ovens. Cuisinart has been building quality appliances for years. So, it didn’t surprise me when the research uncovered this lower priced gem. Although not at the level of the Breville units in human engineering and elegance, it solidly qualified as a GSTW product and it costs about $100 less. It has stainless steel front panels, matte black sides and top, and a wide, easy to grip, brushed chrome handle. This toaster oven does a very good job of evenly toasting, you guessed it, toast! It uses what they call the “Exact Heat™ sensor” temperature control to prevent long spaced, hot and cold cycling of the elements that occurs in the lesser quality products. Something my “Toast-R-Oven” could have really benefited from! It brings 1500 watts of cooking power to the task. Toast is evenly toasted, the Bagel setting toasts a bagel properly and bakes a pizza quite evenly. Its not as fast as the Brevelle convection oven for cooking, but for most toasting and cooking, you will not be disappointed. It does a great job. Keep in mind, that although it may not have all the benefits of the most complete units, if it wasn’t proven to be a product people love to live with, you wouldn’t be reading about it as a GreatStuffThatWorks qualified product. The display, incorporated into the panel below the door is small, but legible. The over 40 gang may need their glasses for this one. It does however incorporate a feature not in either of the Brevelle’s: a clock and oven timer. It also has an easy to clean interior, comes with a stainless steel, two piece broiler pan and the longest warranty, 3 yrs. For a toaster oven that is well made, cooks and toasts consistently and does it at a moderate price, the Cuisinart TOB-155 is a very good value. When I did my company Customer Service Check, I called in December around 8 pm. Cuisinart answered in under 3 minutes, had wide customer service availability hours, especially for the holidays and were both helpful and courteous. 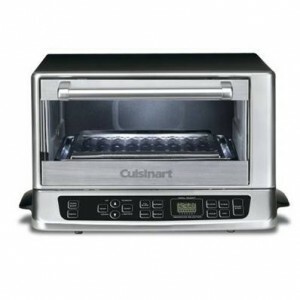 FYI: Cuisinart’s alternative with convection: Cuisinart TOB-195 priced around $179.00. Same basic unit with convection feature. The front, top and sides are also stainless steel finish. However, although people really like living with it, it didn’t make the cut because the side mounted convection fan breaks up the design and is noticeably noisy when cooking. That’s the results for GreatStuffThatWorks Toaster Ovens! Any of the 3 recommended units, the Breville BOV800XL with convection, the Breville BOV650XL compact oven without convection or the Cuisinart TOB-155, should make your life easier and tastier without the frustration of inconsistent results, complex controls or low quality construction. Remember, to help you get a great price with a quality merchant, we also work to track that down. As always, let me know what your results are. We’re all in this together. Until next time, I’ll be out here looking for more of the products you’ll love to live with! For More GreatStuffThatWorks, Click Here! On your advice, I bought the Breville 650XL oven. I love it! 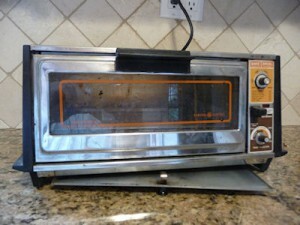 The kids use it to toast bagels or reheat pizza and I use it to warm rolls and toast bread. I chose the small model to fit in a specific space and because I have a convection oven. It heats evenly and has settings for bagels, pizza, toast and more. Best toaster oven I’ve ever had.